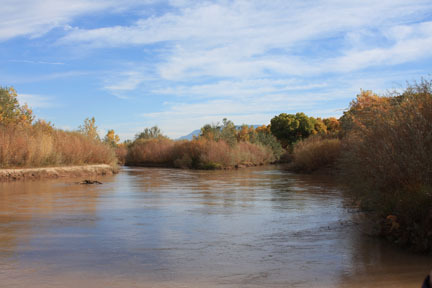 Is the Decline in Avian Density in the Rio Rancho Willow Creek Bosque a Function of Drought? /Hawks Aloft Inc.
Is the Decline in Avian Density in the Rio Rancho Willow Creek Bosque a Function of Drought? Hawks Aloft has conducted avian monitoring in the Middle Rio Grande Bosque since 2004. We monitor 78 transects in a variety of vegetation communities among several management entities. Each half mile route is surveyed three times per month during the summer and winter months only. In our blog post of last week, we addressed our concerns with the City of Albuquerque’s Rio Grande Vision Plan (RGV). Included in that post was a graph that displayed the change in avian density relative to the development of the Rio Rancho bosque in a manner similar to what appears to be envisioned in the RGV. At the public meeting, Chuck Buxbaum, environmental science teacher at Sandia Preparatory School, commented that our graph might show the decline in birds relative to the drought, rather than development. What an excellent question/comment! In response, we took a look at all of our data and developed the graphs below. 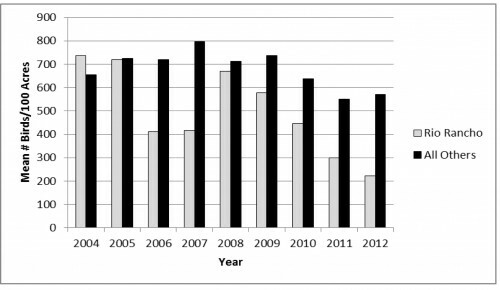 The first graph below shows change in avian density (2004-2012) during the summer months in all vegetation communities combined in Rio Rancho relative to all other survey areas combined. The graph above clearly shows a dip in avian density among all areas during the drought years of 2010-2012. However, across “All Other” areas studied, the decrease in the number of birds per 100 acres did not statistically change between 2010-2012. There was a slight increase in 2012 densities. C-2 Natural = mature stands of cottonwood that averaged at least 12 m in height with a sparse and/or patchy understory. CW6 = Coyote Willow, Type 6. Low, relatively sparse herbaceous and/or shrubby vegetation, with most of the foliage less than 1.5 m in height. OP = Mechanically thinned areas with minimal woody vegetation remaining. 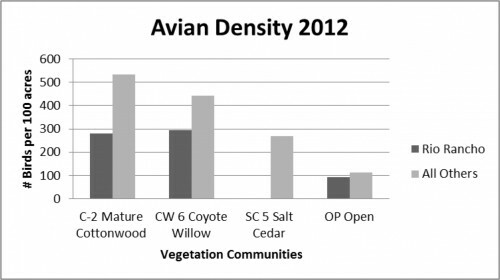 We also included data from the following vegetation community, which historically supports the lowest density of birds. SC5 = Salt Cedar, dense stands with the majority of foliage occurring between 0 and 6 m.
In the graph above, it is evident that the Rio Rancho bosque supports lower densities of birds in each of the vegetation communities. Additionally, when densities in all vegetation communities are averaged, the Rio Rancho bosque supports lower densities than even monotypic stands of salt cedar. We suggest that the ongoing decrease in avian density in the Rio Rancho bosque is due to escalating human use, increased presence of dogs, many of which are unleashed, and the continual and complete removal of all non-native vegetation, including Russian olive, and junipers (although juniper is a native species). Please see the notes below for further information and a timeline of changes that have occurred in the bosque since 2004. If you have any questions, please contact Gail Garber, executive director, or Trevor Fetz, lead avian biologist. 1) Mean avian density in RR equal to or higher than cumulative from other areas in 2004-2005, prior to initiation of widespread clearing in RR. 2) Drop in 2006-2007 in RR corresponds to clearing of all non-native (and some native) vegetation throughout the Willow Creek bosque. We also initiated NW23 in summer 2006, after it had been completely cleared earlier in the year. 3) No clearing occurred in RR between summer 2007 and summer 2008, allowing substantial re-growth of understory and weedy vegetation (especially RO on NW23). 4) Full-scale thinning/mowing resumed in RR prior to summer 2009. Since that time, we have seen a steady decrease in avian density in RR each successive summer. We believe the gravel loop trail was established after summer 2009. 5) The establishment of the gravel loop trail immediately increased human/canine use and associated disturbance of the Willow Creek bosque, which has increased in subsequent years. Based on our casual documentation of humans/dogs on transects, human use has increased each summer. The increased human use/disturbance each successive year mirrors the decreased avian use each successive year, and it appears that there is a direct connection. 6) The drought began impacting summer birds in the bosque in 2010. In areas outside RR, summer density decreased substantially from 2009 to 2011, but rebounded slightly in 2012. The 2012 water year was slightly better than the 2011 water year, which seems to correlate with the slightly better density numbers in 2012 relative to 2011. In contrast, RR density has consistently declined each successive summer since 2008. Assuming the drought was the overriding factor in the decrease in RR, we would expect a decrease in density more along the lines of what has been documented in other areas, not the steady, steep decline that has been observed. 7) Thus, our interpretation is that although the drought has definitely impacted avian use in RR, the increased human use due to the development of the loop trail is at least as important a factor as the drought. That would also explain why density in RR has decreased so much more than in any other area. 8) Density by Vegetation Community/Structure (C/S) type in RR for 2012 is lower than would be expected relative to densities for same C/S types in other areas (see table below). To me, this further illustrates the impact of the loop trail/increased disturbance in RR.